To continue our series about gear discussed during our “Gear Check” Meetup, I am going to write a bit about packs. Packs are one of those things that can be hard to nail down and find a good one that fits, has just the right amount of space, and doesn’t break your bank. 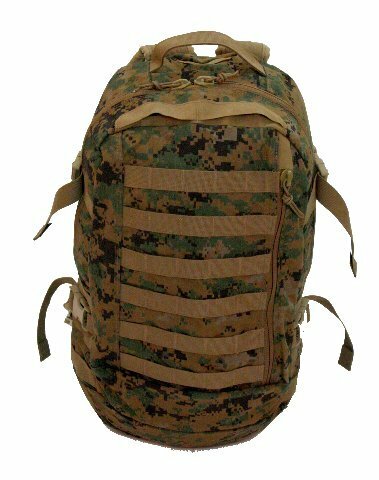 Many people are very into the military surplus packs like the ALICE or ILBE. These can be great bushcraft packs and are made to withstand some heavy duty use. They are designed to make it through combat, so they should be able to handle the occasional dirt stain or rain shower. They do have their drawbacks, however. While I was in the military, I spent about 3 years living out of an ALICE pack. The pack is great, but definitely has its flaws. Let’s discuss the good first. They are one of the toughest pieces of gear I have had the pleasure of using. If the frame gets messed up, it can easily be bent back into shape and lashed back together with 550 cord or an improvised rivet or two can be used until a better fix can be engineered. They seem to have just enough room for a couple day’s worth of gear. Long weekend trips, day hikes, or even packing out meat quarters while hunting fit right within this pack’s limits. For weeks on end or long trips, however, this pack is a bit lacking. There just isn’t enough room. There are large ALICE packs that offer more room, but the frame constraints are the same. Shoulder and waist straps on this are not made for larger people. They are designed for average sized individuals. The shoulder pads are too short without some redesign and modification as are the hip belt and pad. I am not talking about being overweight, either. These straps just don’t fit larger people. If you are not interested in a frame, the better military surplus pack is the ILBE. These packs have pockets everywhere, carry about as much as the ALICE (granted that you are not strapping on sleeping bags and Isomats) and even have some straps that make carrying an axe very easy. If you are thinking “prepper” style or fashion, this is military surplus and therefore screams, “Motivated and military” so it might not be the right style or fashion for you. The nicest thing about it is the fact that the straps and fit are comfortable for small to large sized people without any major modifications. These are also a great pack, but are fairly difficult to come up with most of the time. 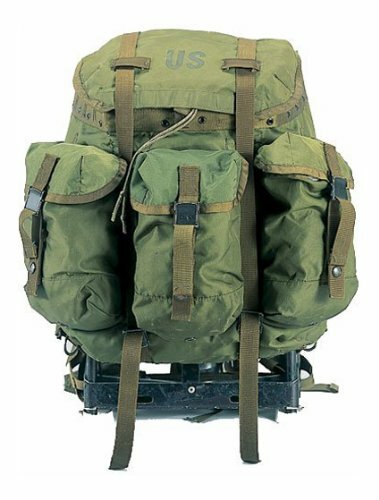 This is the Swedish M39 rucksack. The problem comes down to trying to find one it good condition. They are old and have not usually been treated too well during their life. The nice things about this pack are the axe loop on the side, the large flap that keeps rain and such out and allows you to carry a coat or something under it, and the fact that it is nicely framed with a lightweight design. You will have to do some metalwork on the frame to widen the hip area. It was designed for people with a 26-30 inch waist (guessing while cursing the fit). But once you widen out the bottom portion of the frame, they fit really well and are quite comfortable. Unless you are the size of Skeletor don’t expect to be able to use the leather waist belt. Just figure on either making a longer one or not using a waist belt at all. There is a post to what I built out of an old French pack. Projects like this are quite viable and allow you to make what you want. I highly recommend doing something like this if you are handy. Last but not least is to mention all the Swiss, German, Polish, Swedish, French, etc., canvas rucksacks that are available on the market. Most are WWII surplus and are great options if you care to explore them. The ones I mentioned above are the most common “bushcrafter packs” that people get and modify to their needs. If you can grab one that suits your needs, grab it and get out to use it! Other options are much more expensive, however. You can pick up something from Frost River or Duluth Trading Post. Their packs are INCREDIBLE, but the price point is also INCREDIBLE. That being the case, don’t look while eating. You will choke, so be warned. Of these two, I prefer the Isle Royale by Frost River. The shape, size, construction, etc., seem to be more suited to my particular needs. Although I have not purchased one yet, this is on my short list after I finish up my custom knife purchases. 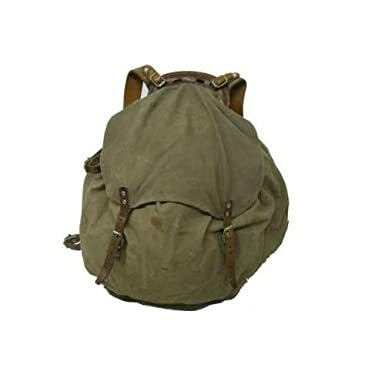 There are also many options that are not “traditional” canvas type rucksacks. So many that it really doesn’t warrant listing them. The main thing to think about while picking your pack is this: get something that will withstand the rigors of bushcrafting, fits you nicely, and holds all your kit. If any of these criteria are not met, you really should just pass on the pack and move to the next one. The most common criteria that they don’t meet is “withstanding the rigors of bushcrafting.” Bushcrafting requires more durable equipment due to the many tools (axes, Scotish augers, knives, saws, etc.) that you carry with you. Most backpackers don’t take as many sharp objects with them like a bushcrafter will. Well, it is time to do some searching and testing of some different packs to find what you like. Don’t be intimidated no matter how scared you get. Just get what you like and what fits you. Most other things can be modified with some ingenuity and a sewing kit. Have some fun and get dirty!!!! This entry was posted in Miscellaneous, Packs and tagged ALICE, backpacks, buscraft backpack, canvas pack, canvas rucksack, M39, pack frames, packs, rucksacks, Swedish M39 on April 18, 2014 by Woodsbum.